The Cardinals confirmed that accounting firm PwC will anchor the 117,000-square-foot office portion of the development, which will be complete in 2020. The project will also include a 29-story, 297-unit apartment tower that will be called One Cardinal Way, a Live! By Loews hotel, and 75,000 square feet of new retail space, including a 31,000-square-foot Onelife Fitness gym. 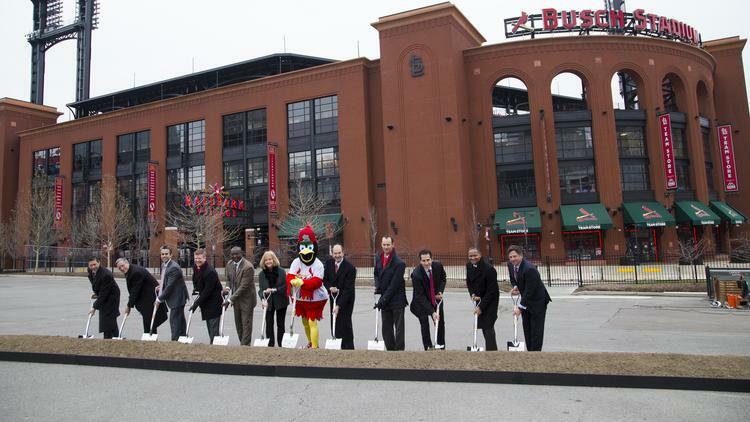 Members of the St. Louis Cardinals, The Cordish Companies and mayor Lyda Krewson at the Ballpark Village II groundbreaking ceremony on December 14, 2017 in St. Louis, Missouri. The city of St. Louis is providing $65 million in subsidies to help finance the development. In October, the city approved the issuance of $119 million in bonds to help facilitate those incentives. The Business Journal reported in February that PwC was to be the anchor tenant of the development. Fox Sports Midwest, which has its headquarters near Union Station, and a retail component for Rawlings, which has a corporate office in St. Louis County, have also been linked to the project. Cardinals President Bill DeWitt III said Thursday that additional office tenants will be disclosed at a later date, and that the organization is in talks with companies from outside the city of St. Louis to fill at least some of the remaining office space. The Ballpark Village office space would be among the most costly in the region with a rent ask of $27.50 per square foot — a 34 percent premium over similar downtown office space and on par with Class A space in Clayton, the region’s most in-demand submarket. A rendering of the class-A office building on the west end of Ballpark Village Phase II. PwC, which currently occupies roughly 53,000 square feet near Ballpark Village at Bank of America Plaza at 800 Market St., will occupy about half of the Ballpark Village office building, or about two of the four levels of the facility, DeWitt said. A portion of the public subsidies on the project is contingent on the development’s tenants creating net new jobs for the city. Cordish Vice President of Development Nick Benjamin told the Business Journal in October that of the 117,000 square feet of office space, 65,000 square feet would have to be classified as net new, meaning roughly 55 percent of the jobs housed at Ballpark Village would have to be net new to the city. 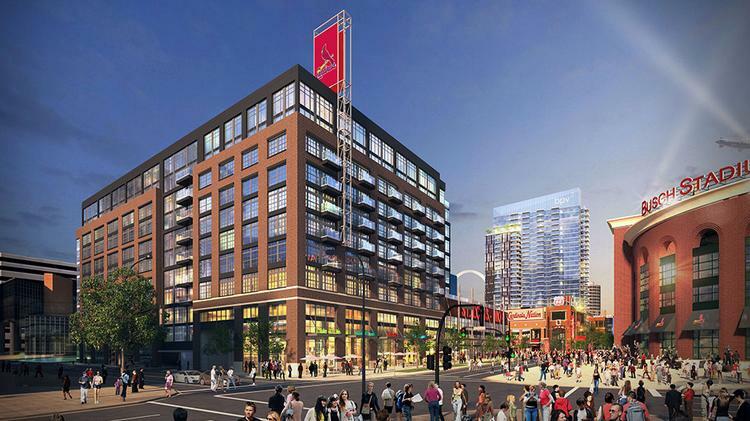 A clause in the development agreement also allows a company already in the city to qualify as net new jobs if it tells the city’s development agency that it would have left the city if not for Ballpark Village’s new office building. For instance, PwC officials have said they’ve also scouted other parts of the St. Louis metro area, which could satisfy the aforementioned requirement if the firm signed an affidavit. 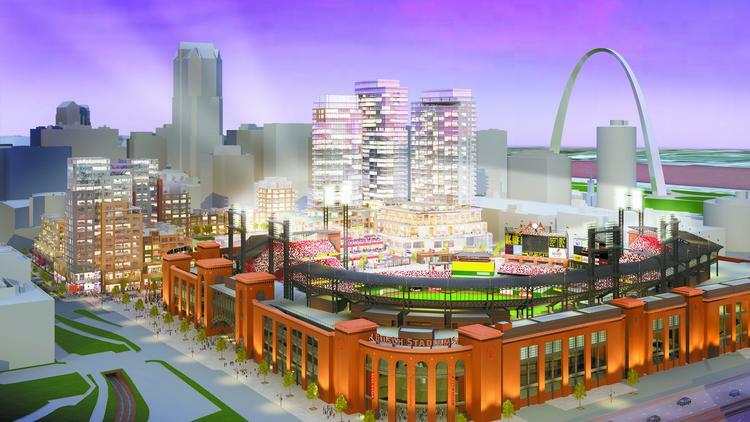 An original rendering of Ballpark Village from 2007.